SB at NY 417 in Olean. I'd like to buy an arrow, Pat. 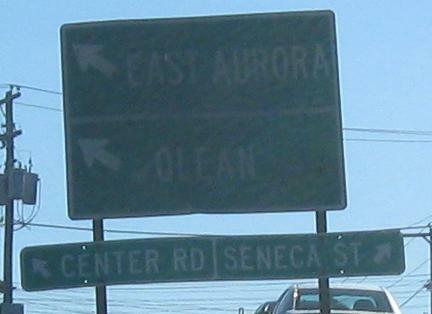 The old decorative signblade at that intersection needs to become a new decorative sign blade reading N. Union St.
NB from 417, of all the old signs in Olean my favorite is the one with "NY" inside. Click for closeup. The first photo includes the oldest Southern Tier Expy. shield I've ever seen, too. 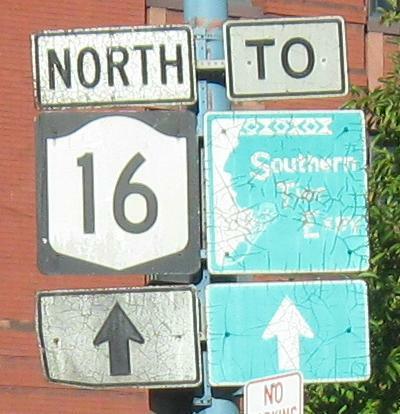 SB leaving Buffalo; NY 16 takes a more northerly route near NY 400 while Seneca St. takes a southerly route along Cazenovia Creek. NY 400 is the road in the second photo. 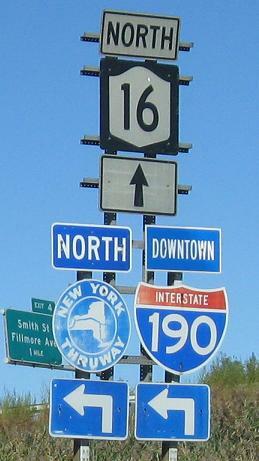 It begins to the right (North), while NY 16 turns left and takes over heading south. Because 400 is the freeway, it was made the main movement instead of NY 16, leaving a short stub of old 16 at the intersection. 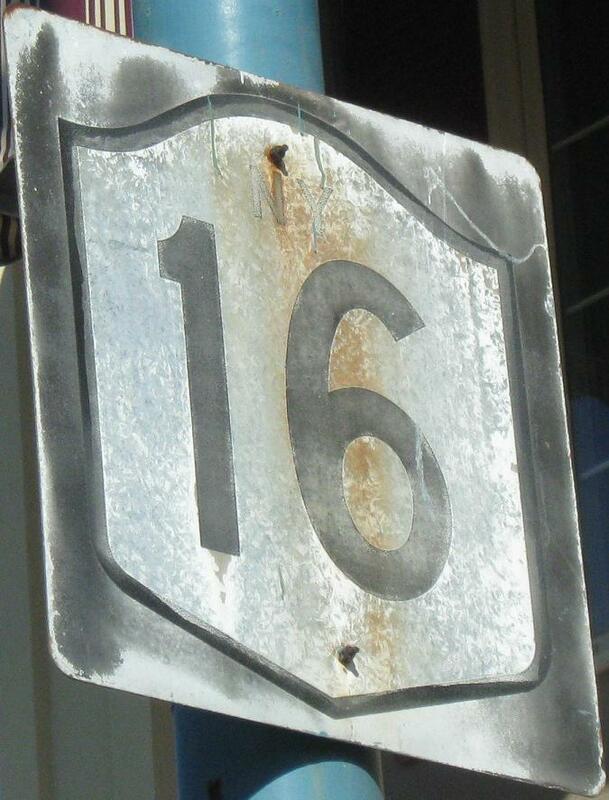 Nothing wrong with two of these signs, and in fact I like the old arrow with the new slightly too-narrow NY 16 shield.. 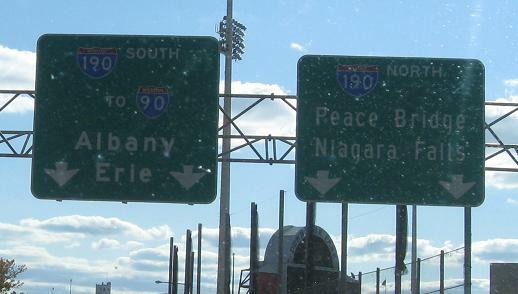 The I-190 is one size too wide (Series E instead of D, maybe) and "DOWNTOWN" should never be used as a direction. 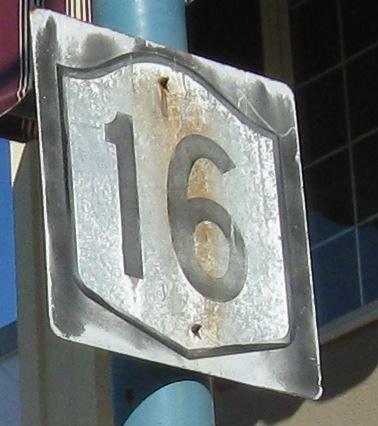 NY 16 NB splits from Seneca St. onto Swan St. At some Buffalo street signs, it turns left onto Oak St. to end at I-190. 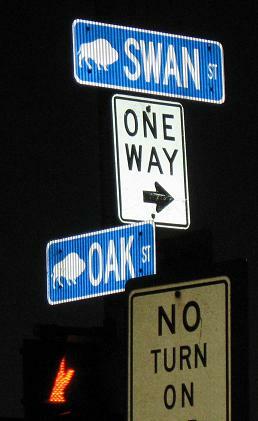 Oak St. is one of the possible continuations of NY 33, a freeway that was never completed across downtown Buffalo. Oak is actually a north-south street, so by turning left onto it, NY 16 NB finishes up heading due south.